Is It an 1873 or an 1878? In 1873 the public had the advantage of knowing that 1878 still lay in the future, and though their coins may have looked like they were dated 1878 that simply wasn't credible. Today, of course, that logic no longer applies. Exacerbating the problem is that the 1878 shield nickel is a proof only issue of considerable value. Hence there is an incentive to advertise 1873 shield nickels as rare 1878s, particularly on low grade pieces where corrosion or other surface deterioration may make date determination even more difficult. Logically, the chances of an 1878 appearing in low grade should be much less than that of an 1873. The proof only 1878s were mostly saved by collectors rather than spent. But logic is not totally sufficient - undoubtedly a few 1878s did escape into circulation and become worn. 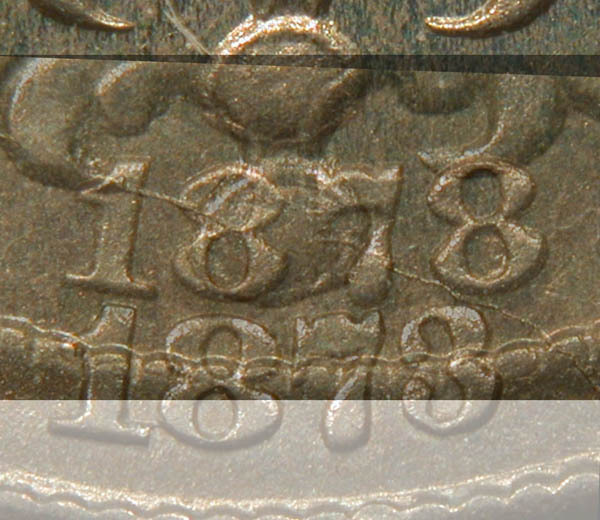 Fortunately for today's collectors, there is a simple way to discriminate between 1873 and 1878 dated coins. In 1878, the spacing between the digits of the logotype is considerably wider than in 1873. It is fairly easy to train one's eye to recognize the difference. Here are pictures of an 1873 and an 1878, taken at the same magnification. I'm using an 1873 Closed 3 in these examples; the spacing of the 1873 Open 3 logotype is the same as that of the Closed 3. It should be fairly apparent that the gaps between the digits in the left photo are considerably smaller than the gaps on the right. Using the magic of Photoshop I'll prove it to you. 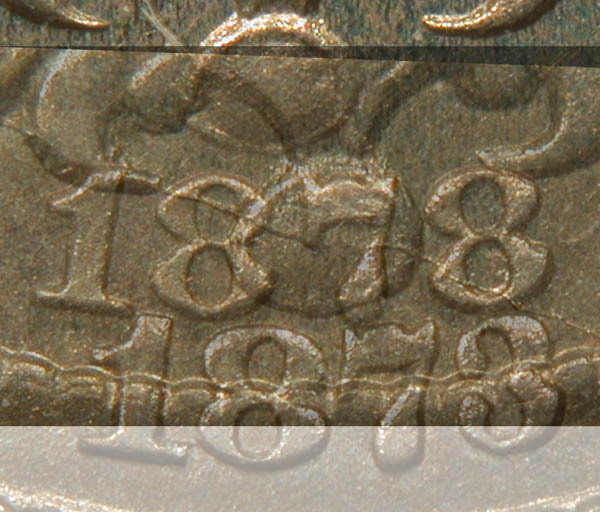 In the photos below, I've made the 1873 date semi-transparent so that you can look through it and see the 1878 date. Now that I've shown that the dates are the same size, I'll slide the 1873 date down so that both dates are more easily visible at once. Here is a photo again showing the "1" numerals lined up. In this photo, you can see that the "3" in the 1873 date is far to the left of the "8" in the 1878 date. 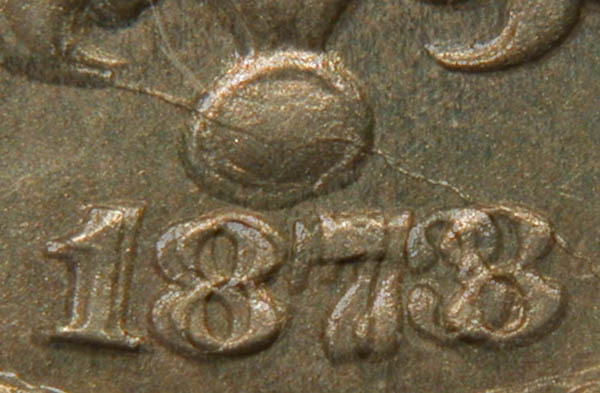 Here is a second photo, aligning the right end of the dates instead (the "3" of 1873 with the "8" of 1878). 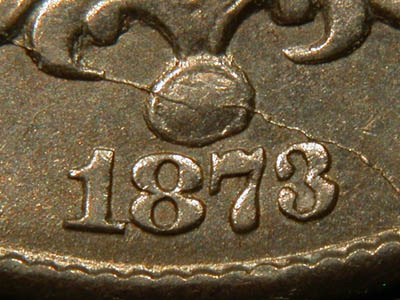 Now the "1" of the 1873 date is quite far to the right of the "1" of the 1878 date. When confronted with an auction for a low grade 1878, remember that if the date has the "squished together" look of the 1873 then it cannot be an 1878. Once you train your eye to see the difference in the two logotypes, you can almost always discriminate between an 1873 and an 1878 even if the auction photo is fairly small. 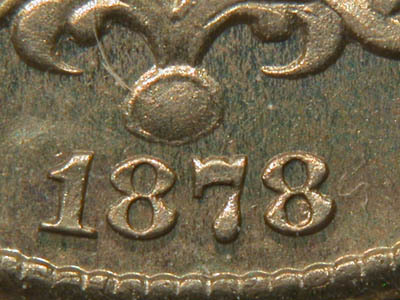 If you encounter a coin (at auction or otherwise) and you aren't sure whether it is an 1873 or 1878, always remember to check the spacing of the digits in the date. Also, please feel free to contact me and ask - I'll be happy to give you my opinion. This page copyright (C) 2005 by Howard Spindel. All rights reserved.